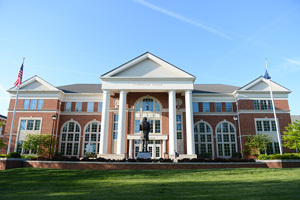 Danville, Ky. (Sept. 16, 2014) — Recruitment has begun at Centre College for the new Grissom Scholars Program, a groundbreaking national scholarship opportunity for first-generation students starting in the fall of 2015. The Grissom Scholars Program will serve as the foundation for Centre’s plan to create the nation’s premiere program for exceptionally talented high-need first-generation college students. Ten Grissom Scholars will be selected from each entering class, with 40 Grissom Scholars enrolled by the fall of 2018. In addition to a four-year, full tuition scholarship, additional aid to cover remaining financial need will be available to those students who qualify. Grissom Scholars will also receive $5,000 in educational enrichment funds after the successful completion of the first year. These funds can be used to pursue opportunities such as study abroad, independent research and academic internships. Established by Marlene and J. David Grissom, the program is funded by the largest single gift ever received by Centre in the College’s 195-year history. Although the full amount is not being disclosed at the request of the donors, the gift is believed to be the largest single donation ever to any Kentucky college or university, public or private. A 1960 Centre graduate and life trustee, Grissom chaired the Centre College Board of Trustees for more than two decades. “For a college so firmly committed to a mission of high achievement and high opportunity, this generous gift is, in a word, transformational,” said John A. Roush, president of Centre College. “The Grissom Scholars Program will significantly impact for good the lives of hundreds and thousands of first-generation students in the years and decades to come. Not only will the recipients benefit from this generosity but so will all the many communities, organizations and professions positively influenced by the leadership and service of our Grissom Scholars,” Roush added. Interested candidates must apply for admission to Centre by January 15, using the free Common Application, and also complete the Free Application for Federal Student Aid (FAFSA) and the Centre Aid Form by Jan. 31.